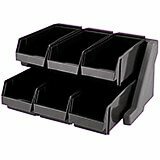 Condiment holder / organizer with 6 bins, 3 across x 2 high. Simplify dispensing non-perishable condiments, flatware and napkins. 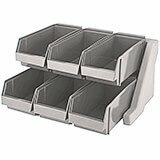 Versa Line Organizers Combined Pack include Bins and Rack. When wall mounted, each bin can hold up to 10 lbs. 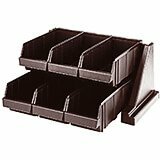 Seamless, one-piece polymer racks require no assembly, are easy to clean and hold 6 bins 3 across x 2 high, bins included. Wall mount or place on a flat surface. When wall mounted, each bin can hold up to 10 lbs. (4.5 Kg).